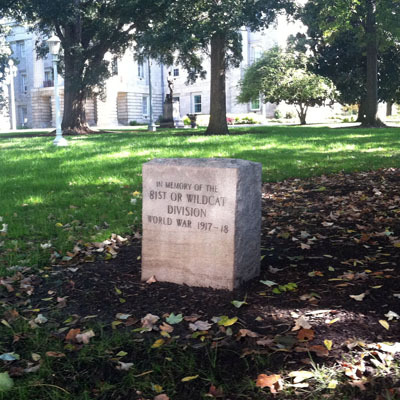 Description: This small stone monument has a smooth, inscribed face with rough cut top and sides. It is dedicated to the 81st Infantry Division for their service in World War I. Subject notes: Although officially organized as the 81st National Army Division, the battalion came to be known as the Wildcat Division and entered the war theater in France toward the end of the war in 1918. With draftees primarily from North Carolina, South Carolina, and Florida, the group took on the name to reflect the fierce fighting and tenacious wild cats of the South and adopted a patch made from the silhouette of the cat as their insignia. They fought in the Meuse-Argonne Offensive in 1918 and were in combat against the Germans in Verdun when fighting ceased on November 11 with the armistice. The Wildcat Division suffered 1,104 casualties during their short time in the war. Location: The monument is located on South Salisbury Street on the southwest corner of the North Carolina State Capitol grounds. The front of the monument faces the street. Landscape: The monument sits on the lawn beneath mature shade trees. I'm looking for any info anyone might have regarding my Grandfather, Jay Shepard, of NC who served in the 81st in WWI. He spoke of being a Runner during the war, delivering messages. He was mustard gassed, but, obviously, survived it. Thanks. My grandfather, Edwin B Pfaff, was in trenches with the 321st regiment of 81st in Meuse-Argonne battle, Verdun. I have an original runner-delivered message sigbed by Greene that ordered cessation of hostilities on 11:11:18 at 11:00 hours. I believe the name of "Wildcat Division" as actually because the Division (WW1) trained at Camp Jackson, S.C. and captured a wildcat which became a mascot for a short time. As a member of the 81st Infantry Division 1961-1965, this is the history we were taught as I remember. Perhaps an older vet may can confirm. Existing accounts of the naming of the 81st Division are split. One theory has to do with the location of the division's training areas adjacent to Wildcat Creek, which ran through Camp Jackson. The other theory was the nickname came from a Carolina wildcat captured by some of the rural draftees. One account from a veteran describes the wildcat riding in a steel cage atop the coal tender when the division left for Long Island, New York.